A lot of the travel stories I read online are a tad, well, shallow. I see plenty of Hey, look at me and what I did! stories, or various lists of top five this or that, as opposed to anything with depth or substance. I’m guilty of that, too. Without a doubt. It ain’t easy to write great stories, especially travel essays and especially on such a frequent schedule as most bloggers try to post. A big chunk of your soul goes into a good story. So to read a whole book full of them in The Best American Travel Writing of 2013 is quite a treat. 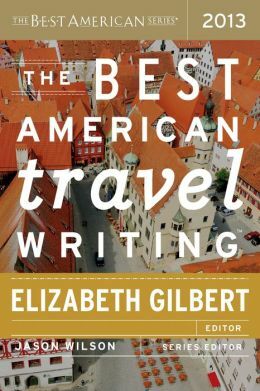 After performing a huge eye roll at seeing Elizabeth Gilbert of Eat, Pray, Love fame as the annual editor, I ordered my copy online of The Best American Travel Writing as soon as I saw it was for sale. Sure, I liked Eat, Pray, Love all right, but wasn’t gaga over it like a lot of other people I know. Gilbert had a great story to tell, there’s no doubt about it, but it seemed like it went to an unmerited level of insanity for some fans. And so I worried there’d be more of that with The Best American Travel Writing, and that Gilbert would pick a lot of touchy feely soul-searching crap for the compilation. Despite my doubts about Gilbert’s selections, I made sure to be finished with all of the other books on my plate by the time my edition of The Best American Travel Writing of 2013 arrived in my mailbox. The last five compilations I’ve read were all great. I assumed this one would be the worst of the six. But, nonetheless, I assumed it’d still have some merit and be a somewhat decent read. Enter the first story: A Prison, A Paradise by John Jeremiah Sullivan, published in The New York Times Magazine. Holy cow. What an opening story. In her introduction, Gilbert expressed she initially had doubts about a story of a man traveling to Cuba to see family. I did, too, since she selected it as the opening story for the book. But boy was I wrong. A Prison, A Paradise was a great look at life in Cuba, and in a much needed personal tone that is so often lacking in stories about anywhere. This pick was smartly followed by Kevin Chroust’s The Bull Passes Through from The Morning News. A long standing dream of mine is to run with the bulls in Spain. Don’t ask me why. I really don’t know, but it’s something I’ve always wanted to do. And to read Chroust’s account of it really got my blood flowing. His word selection was, dare I say, perfect. He constructed an energy that began as a low anticipatory buzz and ended in a great rush of adrenaline. Hiking in Papua New Guinea (Judy Copeland’s The Way I’ve Come), a Westerner walking through an Egyptian market in a niqab (Colleen Kender’s Blot Out), and a tale of a trek to see a man who supposedly discovered a cure for AIDS (Jesse Dukes’ Babu on the Bad Road), all offered an equally interesting rush. More of it comes, too, in the likes of the Caliph of the Tricksters by Christopher de Ballaigue (Harper’s Magazine), a story about illegal cockfighting rings in Afghanistan. Well, that’s what all of these are about on the surface anyway. Any one of them could be taken to have deeper meanings, which is what makes them so great; lessons masked in an interesting tale of travel. Probably my favorite story, though, and one of the best stories I’ve read in years, is Daniel Tyx’s The Year I Didn’t from Gulf Coast. Just like the others, I rolled my eyes at this one when Gilbert started talking it up in her introduction. I instantly assumed I wouldn’t like it. Sure, the story sounded interesting enough, but how good could it really be? Well, really good to be quite honest. Tyx’s account about the time he didn’t walk the U.S. border with Mexico, as he had planned, and someone else did, really broke down some barriers for me in travel writing. Do all travel stories need to be about going somewhere, doing something? Nope. The best ones can actually be about doing something else: nothing. And the way Tyx does it, in a very fluid manner, makes me reassess all of the times I didn’t when I thought I would or should. OK. Time to be honest. I admit that my oh so grand assumption of Gilbert’s choices for this book was way wrong. Each of the stories was fantastic. Heck, they were so good that I might even be bold enough to say this is the best The Best American Travel Writing I’ve read yet. They were that good, and nothing like I had expected from Gilbert – which is probably why I liked them so much. Amongst names like David Sedaris and Ian Frazier – who Gilbert selected without knowing their identities – if I had one complaint about The Best American Travel Writing of 2013 it would be that the book wasn’t long enough. At only 200 pages – which is shorter than the previous five editions, sometimes considerably so with others running well over 300 pages – the compilation runs a tad thin. I would have liked more. But, in the end, isn’t that the whole point anyway? Shouldn’t the author, or editor in Gilbert’s case, leave the reader wanting more? Yeah. Probably. But that doesn’t make the fact that I want more go away. Thanks for reminding me of the old fashioned travel media called print. I used to read a ton of books, but since I have been blogging have read a lot more online. My New Year’s resolution is to read more books thanks to this post. I think I average a book a week. Not all of them, of course, are travel books, but probably one out of every four or five. I love to read, particularly a book-book…no e-readers here! I get enough of computers at work and in my writing.